While this looks like a very simple and unimportant article, clinically speaking the author illustrates a very important issue. Very frequently successful treatment of original symptoms the patient came in with coincides with the appearance of new symptoms that look like completely unrelated parts of the body. The author is completely correct when he explains in this piece an important clinical observation: the decrease of intensity of the original symptoms will make symptoms which were hiding behind the original ones clinically prominent. This scenario confuses patients since they may think that despite improvements the treatment triggered new symptoms. In reality the author has correctly labeled it: The Loudest Voice Wins. This article raises a very important topic for therapists and we observe it daily in our clinic and clinics associated with SOMI. Patients who take statins regularly complained about various musculoskeletal syndromes. Therapists should be aware of it since their therapy may fail because the initial trigger in satins is still in the body. A small but very good article which covers biomechanics of the foot. The article raises a lot of important points which can be summarized in a way that Postural Changes are responsible for patients’ pain and discomfort and working on the soft tissues while postural changes are not addressed greatly diminishes the clinical effectiveness of MT. Yes, the author is correct here, but only in a minority of clinical cases. Based on our clinics combined experience it is approximately 20%. Thus, postural changes may trigger symptoms the author mentioned. However, in a majority of cases the postural changes develop by the brain and secondary reaction to the chronic pain. In such cases addressing the postural changes themselves also becomes a waste of time and effort since the initial trigger must be identified and eliminated first before postural changes should even be considered. However, nowhere in the article does the author actually show to therapists a picture of what the early stages of SCC look like. 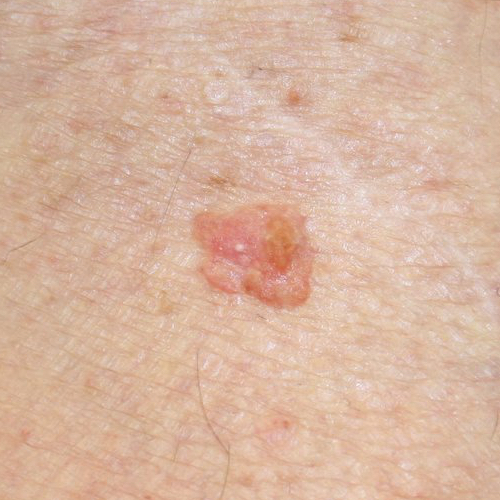 If the article doesn’t provide a correct image of SCC, the entire goal is diminished to the level of basic info without ANY clinical significance. This is the weakest part of the article. Considering the importance of the subject the author raised, but didn’t follow through with, we decided to fill the informational gap in the article and show a picture of the early stages of SCC. A very good introductory article on intervertebral disks. A very good article on a rarely mentioned subject. This article covers the important subject of balance in activity of the autonomic nervous system, specifically the increase in the parasympathetic or vagal tone. This subject is especially important in light of new convincing evidences that the body doesn’t have sacral parasympathetic division as we all previously thought. We have only one concern – that the article heavily relies on the Polyvagal Theory proposed by S.W. Porges, PhD. This theory is definitely ‘food for thought’ and a great point to start discussion, but at the same time it is just theory based mostly on circumstantial evidence. However, we agree with the authors that extending learning including Polyvagal Theory will widen therapists’ intellectual horizons. The author is completely correct when he states that the dental only approach won’t be able to deliver stable clinical results for patients with TMJ Dysfunction. However, he is mistaken again when he discusses the treatment options. Mr. McCann considered various biomechanical changes in his patient with TMJ dysfunction as indicators of the tension inside of TMJ built up as a result of pelvis rotation, chest twist, shoulder elevation etc. Clinically speaking the author puts the chicken before the egg since all these biomechanical abnormalities in a majority of cases are secondary developments triggered by the brain as a reaction to chronic nociception stimuli which bombarded his patient’s brain for some time. We bet that this treatment was a key to the author’s success since we observed almost identical response from our patients to similar therapy for patients with TMJ dysfunction triggered by Minor Occipital Nerve Neuralgia. Freeing the minor occipital nerve will deliver quick results and addressing pelvis and chest (as the author did during following sessions) targeted secondary biomechanical and postural syndromes which in many cases will fade away by themselves if headache and TMJ pain are not factors anymore. So, without fully understanding what did actually happen to the patient, the author used initially correct treatment strategy which had nothing to do with his views of the necessity of addressing secondary symptoms as the main treatment option. Readers may have a reasonable question: What is the difference? The author helped the patient, and this is what counts. Working with TMJ patients on daily basis we are sure that correct evaluation is the key to the correct treatment option. The author made a mistake in evaluation, but ironically used the correct treatment option. However, it can’t always be the case since identifying the initial trigger of the somatic abnormality is the foundation of 100% effective somatic rehabilitation. We think that for the MT to be fully accepted as a legitimate part of somatic rehabilitation and become part of medicine we all should agree on at least some basics. If there is no unified vision on simple things how can therapists present their case to other health practitioners? There is no way in any other part of medicine one can find completely different pieces of information regarding the same topic. We regularly observe this phenomenon among authors and educators who are addressing the clinical aspects of MT. This article is great example of such an unfortunate trend. Both authors also cited several studies which examined the popliteus muscle using electromyography and all authors found that the muscle first of all produces medial rotation of the leg. Its participation in the knee flexion is minimal. Unlocking the knee joint from extension, which the author mentioned in the article, happened first of all because of lateral rotation of the femur during weight bearing (Travel and Simmons, 1983). Thus, the popliteus muscle very weakly supports knee flexion mentioned in the article in the first position while its main action is medial rotation of the leg. Let’s look at Fig. 2 (Fig. 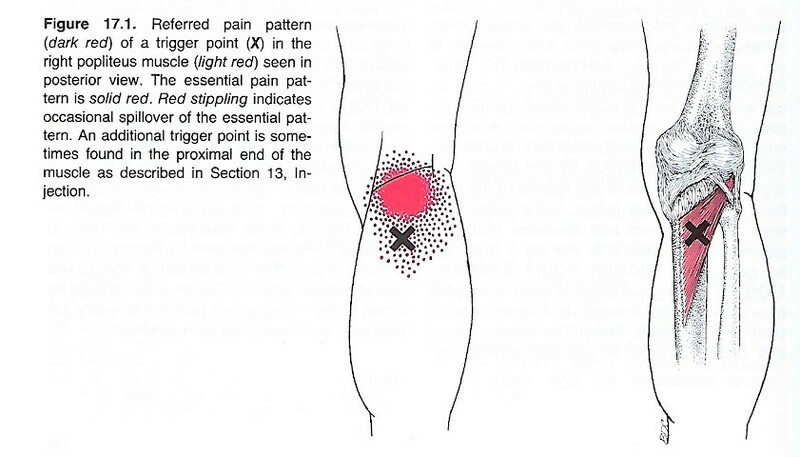 17-1 from Travel and Simmons, 1983) which indicates a pain pattern generated by the tension in the popliteus muscle. We ask readers to match the information in the picture with the quote from the article which indicates that the patient with tension in the popliteus muscle will exhibit pain on the “medial and/or front of the knee” as the author suggests. Let’s for the sake of discussion consider that the author will make the point that Travel and Simmons’ textbook is an old publication. Let’s look at the same topic in recent medical literature. Chang et al., (2016) used Ultrasonography to examine as they put it, “Uncommon cause of posterior knee pain (bold by JMS)” generated by a tensed popliteus muscle. Cho et al., (2016) reported a very rare case of the tibial nerve compression by an enlarged popliteus muscle with all symptoms located on the posterior (bold by JMS) knee and leg. As readers may see, the article provides completely misleading information about the nature of tension in the popliteus muscle but what is more important, it misleads therapists in evaluation and eventually treatment opinions since if the evaluation is done incorrectly the therapist will make treatment mistakes. What is really upsetting is such low writing standards exhibited by the author who addressed the clinical issue with erroneous assumptions and didn’t even bother to do some basic Google search before writing a piece for a national publication on a clinical subject. If we can’t agree on such basics where pain in case of the tension in popliteus muscle is located, who in the medical profession will listen to our pleas about the clinical effectiveness of MT? Chang KV, Hsiao MY, Hung CY, Özçakar L. An Uncommon Cause of Posterior Knee Pain: Diagnosis and Injection for Popliteus Strain Using Ultrasonography. Pain Med. 2016 Apr;17(4):795-6. Very informative article on coordinated movements between the scapula and shoulder joint. The author is completely correct when he emphasizes the frequently overlooked issue of Lymph Drainage Massage not only being helpful in the cases of edema, but it must be a component of every clinical application of MT. LDM is indeed the structural component of each Medical Massage Session. This is very introductory article on Diabetes, indications and contraindications for MT applied for the diabetic patient. This article is on an important clinical subject but the piece itself gives extremely limited information for readers. At least some general outlines or examples would be excellent additions. Without them the article has very limited practical value. This article is a rare piece on the correct application of vacuum as part of rehabilitation.